Kaspersky Total Security – Multi-Device is our ultimate security solution… protecting your privacy, money, identity, photos, files & family against Internet threats, cybercrime and malware. That’s why we call it total security. 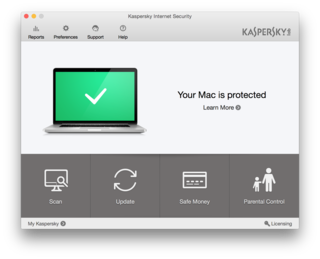 With just one product – and one license – Kaspersky Total Security – Multi-Device gives you our highest levels of security… whether you’re using your PC, Mac, Android phone or Android tablet. When you’re at home or out and about – whichever device you’re using – you benefit from our most flexible, total protection product. Innovative technologies help to keep your private life totally private. Webcam Protection prevents unauthorized access to your PC webcam – so criminals can’t spy on you. 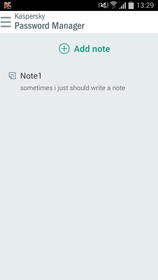 It’s also easy to encrypt confidential documents and ‘shred’ unwanted files. To help keep your mobile communications private, if anyone picks up your Android phone, Privacy Protection stops unauthorized users seeing details about your calls & messages. Whether you’re using a PC or a Mac, our unique Safe Money technology automatically adds extra security when you’re online banking or shopping – so online fraudsters can’t steal your money or account details. No other security vendor offers this award-winning set of protection technologies – and independent testing * has recognized Safe Money’s capabilities. Anti-phishing features defend you against hackers that try to steal your money and identity. 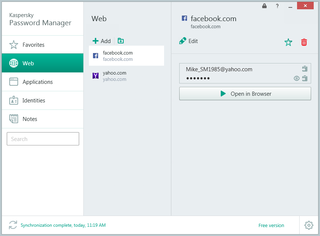 In addition, Password Manager helps you create, protect & manage passwords for all your online accounts and favorite websites. Furthermore, because your precious memories and documents all need to be safeguarded, we’ve included cloud-based backup – so you can keep online backup copies of your photos, videos, music, financial documents & more ** . It’s easy to share your digital assets – and you can access them on any of your devices. Because the Web holds many dangers, our award-winning Parental Control features make it easy to protect your kids when they go online. Parental Control helps you defend children against sexual predators, block inappropriate content, prevent app store purchases, control access to games & social networking websites and prevent disclosure of personal information. Because Kaspersky Total Security – Multi-Device combines protection and efficiency, all your devices can keep performing as they were designed to. Our security technologies work ‘behind the scenes’ – and that means superior security doesn’t have to slow down your digital life. **Online backup service is provided by Dropbox. Currently, Dropbox’s standard conditions provide up to 2 GB of storage free of charge. 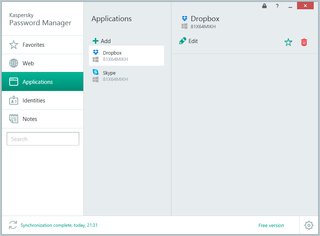 The maximum capacity of the free storage service may vary in accordance with any changes in Dropbox’s standard conditions. Additional backup storage capacity is available for an additional charge. Powerful security technologies – running on your device – combine with real-time, cloud-assisted defenses… to protect you against new and unidentified viruses, spyware, Trojans, worms and other malware threats. Vulnerabilities within commonly used applications can give hackers a gateway into your PC. Kaspersky Lab’s Automatic Exploit Prevention scans your PC for vulnerabilities and controls the actions of any applications that contain vulnerabilities – so that hackers can’t exploit them. Kaspersky Lab’s Wi-Fi Security Notification 2 feature automatically verifies the security of the Wi-Fi connection you’re using, checks for vulnerabilities, warns you about potential risks and advises you on adjusting your security settings. 2 Wi-Fi Security Notification is only available for Windows PCs. Application Control and our Trusted Applications Mode give you control over which applications are allowed to run on your PC – so it’s easy to ensure only the applications that you trust can run and it’s simple to prevent harmful applications from launching. System Watcher secures your PC against dangerous behavior by malware infections – and lets you rollback malicious actions. In addition our Anti-Blocker technology helps to unblock your computer if it’s being blocked by a blocker Trojan. Kaspersky Lab’s Network Attack Blocker detects suspicious actions and blocks attacks – so cybercriminals can’t compromise your security or impair the performance of your computer. Our powerful anti-banner engine blocks annoying – and potentially dangerous – banner adverts. Spam messages can be distracting and time consuming. Kaspersky Lab’s anti-spam technologies prevent them reaching your device. Kaspersky Lab’s latest anti-phishing engine helps to prevent you disclosing sensitive information to phishing websites that can try to use your confidential data to steal your identity and your money. Innovative security technology prevents unauthorized, remote access to your webcam – so no one can use it to spy on you or your surroundings. 3 Webcam Protection is only available for Windows PCs. When you open a bank or payment website, Kaspersky Lab’s Secure Keyboard technology automatically prevents keylogger malware from accessing the data that you type on your PC’s keyboard. Our unique Safe Money technology adds an extra layer of security whenever you use your PC or Mac to access online banking, shopping or payment systems – so online fraudsters can’t steal your money, credit card numbers or bank account details. The FREE version of Kaspersky Password Manager lets you manage fifteen passwords for web and / or app accounts – plus one identity card 4 . 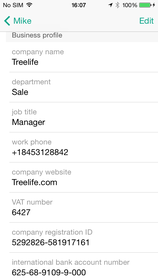 If you buy the premium version, you can store and use an unlimited number of passwords & identity cards. 4 An identity card can contain a range of personal information – including your name, address, date of birth, credit card details and more – to help enable automated completion of web forms, when you’re using your PC or Mac. Award-winning Parental Control features make it easy for you to defend your children when they go online – to help you protect against sexual predators, block access to inappropriate content, prevent app store purchases, control access to games & social networking websites and prevent disclosure of personal information. A single product – with one license – lets you protect any combination 5 of PCs, Mac computers, Android phones or Android tablets… so you benefit from rigorous protection technologies, regardless of whether you’re at home or you’re out and about. 5 The product can be installed on the number of devices granted by the license that you purchase. Your My Kaspersky account makes it easy to manage your security. 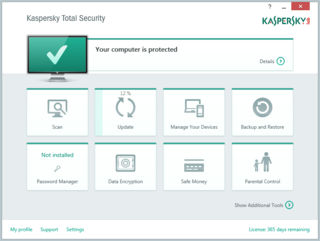 Whenever you’re online, you can check the security status of all your online devices that are running Kaspersky Lab security software, manage your product licenses and activate security features 6 . 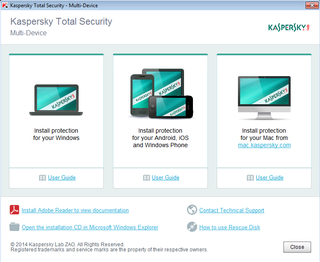 6 Security features activation is only available for Kaspersky Total Security – Multi-Device. Our Cost-Aware Networking feature automatically prevents you exceeding the data limit that you set – so you can easily manage and optimize your data traffic usage, whenever you’re using your PC to access the Internet via public Wi-Fi or 3G & 4G networks. 7 Cost-Aware Networking is only available for Windows PCs that are running Windows 8 or higher. In addition to our online knowledgebase, you can contact Kaspersky Lab technical experts via email, live chat and phone. *Some product features might work on 32-bit operating systems only. 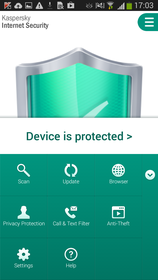 ** Only Kaspersky Safe Browser is available for this platform.